ALSA Semiconductor, a division of DALSA Corporation (TSX:DSA), an international high performance semiconductor and electronics company, announced today that it has successfully fabricated and delivered the world’s highest resolution image sensor chip to its customer, Semiconductor Technology Associates (“STA”) of San Juan Capistrano, California. The CCD device, which measures approximately four inches by four inches, has a total resolution of over 111 million pixels (10,560 pixels x 10,560 pixels at 9µm). It is the world’s first imager to break the 100 million pixel barrier. 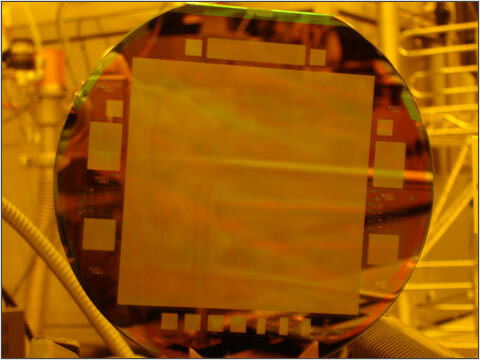 STA developed the record-breaking chip for the Astrometry Department of the U.S. Naval Observatory (“USNO”), funded by the Navy’s Small Business Innovation Research Program. The device will assist USNO in the determination of the positions and motions of stars, solar system objects and the establishment of celestial reference frames. DALSA Semiconductor manufactured the device for STA at its wafer fabrication facility in Bromont, Quebec. "As with past custom image sensor projects, I'm very satisfied with the versatility and capability of DALSA Semiconductor's foundry to collaborate on new process enhancements and to manufacture challenging custom CCD image sensor products such as this," commented STA President, Richard Bredthauer. "I'm very pleased that we were able to deliver, ahead of schedule, this custom CCD image sensor to our long time DALSA foundry customer, STA," added Ralf Brooks, President of DALSA Semiconductor. "Completing this challenging, yet successful, project once again illustrates our strong process technology portfolio and our ability to work closely with our customers to create truly unique products."